Time is relative. As Einstein theorized more than a century ago, its rate of passage changes depending on your speed and the gravity around you. Since most of us won’t be spending a lot of time at lightspeed or on the International Space Station (but hey, you never know), the most time dilation we experience is during international flight, where we’ll age a few billionths of a second more slowly than those suckers on the ground. Yet we’ve all experienced a fluctuating flow of time on the psychological level—the way time plods along in a tedious meeting, for instance. Although it’s primarily about traveling through time, Super Time Force’s structure evokes our brains’ unreliable, unscientific perception of time’s passage. Players are given 60 seconds to march across a chaotic pixel-art battleground, but at the press of a button or when your character dies—which happens a lot—you can rewind time to almost any point and drop in a new goofy soldier. You’ll assume control of this new warrior, but the space-time phantom of your previous life will play out as it did before: shooting the enemies you shot, snagging the collectibles you snagged, and possibly making the same fatal mistake. Between all the dying and rewinding and playing the same bits of a level again and again until you squeak by—or pull it off perfectly, if you’re so inclined—any given stage can take around five to 10 minutes. But once you’ve cleared it, you’re treated to an instant replay of the level in real time—the game world’s real time. As far as Super Time Force is concerned, what might have been an intense 7-minute struggle for you could be a 45-second sprint in the replay. Every soldier spawned from your time-defying portal shows up clear as day, all at once, fighting their hearts out until they make way for the next would-be hero. The reason the developers at Capybara Games included the replay feature is obvious: It’s fun to watch the madness of a Super Time Force level unfold, especially when paired with the jaunty chiptune that scores each video. Bullets and explosions fill the screen, and a particularly tough section is full of the cartoonish wails and flying bodies of your fallen soldiers. But juxtaposing the two technically identical playthroughs—the sometimes long, arduous trek through the game’s difficult obstacle courses compared against the short, kinetic replays that let you bask triumphantly in your own handiwork—is a snapshot of time’s relativity. It’s reminiscent of the so-called “return trip effect,” the sensation that a journey to a strange place takes longer than the trip back home. It took a while to wrap my brain around the time-travel element. 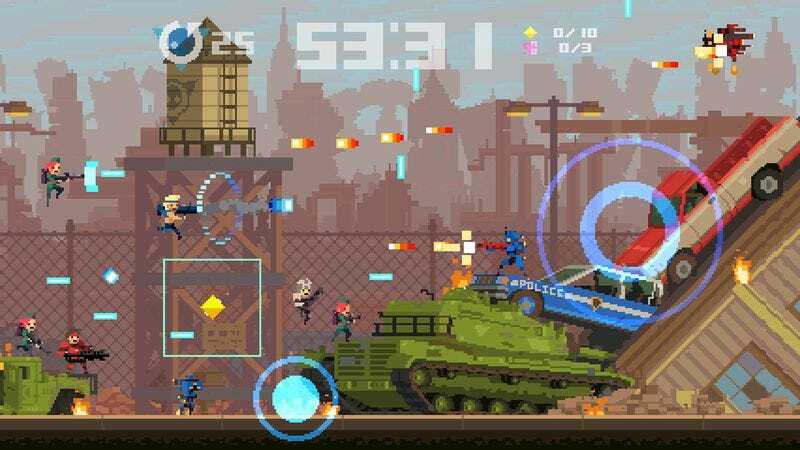 The key breakthrough was to stop thinking about Super Time Force as a jazzed-up tribute to old “run to the right while shooting stuff and sometimes jumping” classics like Contra. I mean, it is a jazzed-up tribute to the likes of Contra, but it takes that skeleton of an idea and builds a savage, complicated puzzle game around it. Using the rewind to brute-force your way through enemy emplacements only goes so far. The levels are designed in a way that encourages strategic rewinding and use of your expanding arsenal of characters, each of which has two unique abilities. You could, for example, use the aptly named Shieldy Blockerson to create a protective aura and then rewind time to drop in Jean Rambois, who can let loose with his cannon’s three-pronged bullet stream from within the safety of Shieldy’s bubble. For added firepower, you could keep rewinding time and adding more copies of Jean (or any other offensively minded soldier) to your impervious death bubble. This combination is as simple as it gets. It’s not uncommon to spend several minutes constructing elaborate deathtraps during the game’s long boss battles, so that ultimately, your squadron of temporally displaced fighters tears the bad guy to shreds in 60 seconds or less. In case it wasn’t obvious from the names dropped in the last paragraph, Super Time Force is silly. Here’s the story: The Super Time Force, which is basically the G.I. Joe squad with time-travel capabilities, defends Earth from an invasion of the Blounbots. Now, with the respect and adoration of the planet, the team’s leader, Dr. Repeatski, decides the best course of action is to head into the past and change key moments in history to make the present more totally awesome—by saving the dinosaurs, for instance, so they can exist until modern times and become our buddies. Super Time Force’s reverence for classic video games is matched by its passion for puns. This is the kind of game where, in a level inspired by Mad Max, you save a character named Melanie Gibson and make your final stand in the “Funderdome.” The developers commit to the gags, enough so that what could be grating is instead charming. That goofiness belies what is ultimately a ­showcase for Capybara’s serious game design chops. Revisiting levels with new skills and experience reveals how carefully crafted the world is. Collectibles are placed in just the right places, easily visible and within reach, but just hard enough to nab that some rewinding and retrying is typically needed. Enemies are planted in spots and fire in patterns that anticipate players’ instincts, a design feat that’s especially impressive given the mind-boggling number of possible approaches. The quest culminates in an exquisite final boss fight that does clever things with the “building an army of gun-toting time ghosts” concept and pushes every danger the player has faced to new heights within one prolonged battle. It seems prolonged, at least. Once it’s over and you’re watching that replay, the whole thing only takes a minute. It’s weird how the trip there always feels longer.